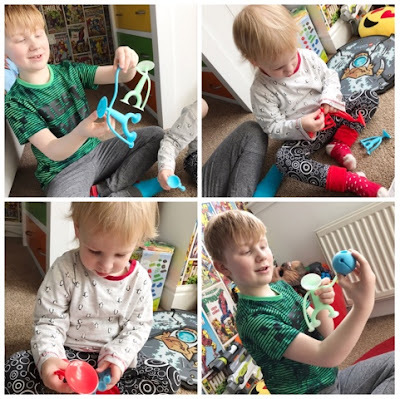 As it's Autism Awareness Month it's only fitting that I should have a post on the blog regarding autism. All parents of autistic children will know that when it comes to toys and autism there are no rules. 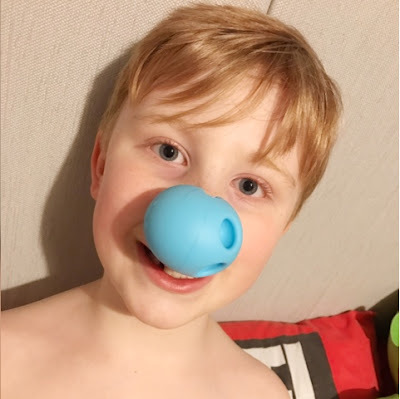 Whatever you think a child would normally do with a toy throw that idea out of the window as anything goes in the autism world. Autistic children (and adults) do have some specific likes but with such a wide spectrum everyone is different and has their own little quirks and special abilities. 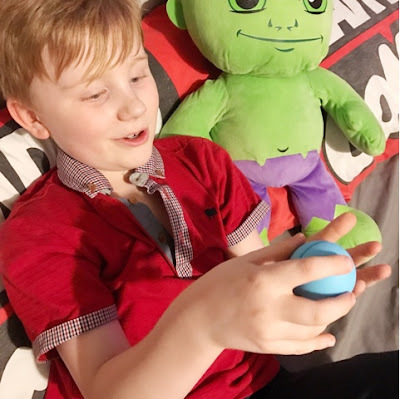 Luckily for us, and of course Logan, we've been working with Toyella to investigate some fantastic toys for children on the spectrum. Toyella have been very kind and sent Logan a few different toys to test and try out. They event wanted to include Harlow so she didn't feel left out which was so very kind of them. So first up and under investigation are the Moluk Mox sensory balls. We received two of these, one for Logan and one for Harlow. They look like simple little balls but they can be used for so many different things. Mox are basically multi-purpose sensory balls with two eyes and a mouth. Logan was instantly drawn to the colour, pale blue, as blue is his all time favourite colour in the whole world. When he picked the ball up it fit perfectly in his hand and he described so clearly how he loved the soft texture and how smooth the Mox was. He wasn't too sure what to do with it to start with, asking me what he should do. I told him he could do whatever he wanted and pointed out that the Mox looked like it had a face. He picked up on this quickly and proceeded to make the ball talk and sing and interact with any other toys around him. 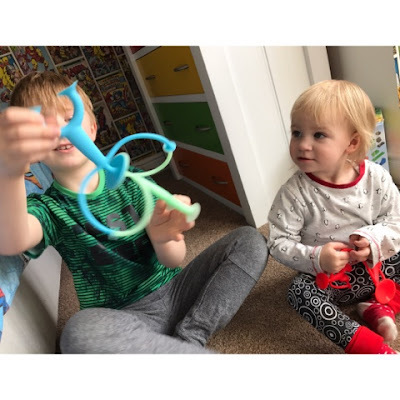 Logan really liked the Mox balls, so did his little sister, he even took them to school to try out as a fidget toy. His support worker thought they were pretty cool and a bit different but did say they only kept his attention for a little while before he moved onto the next fidget. Logan seemed to play with them more at home and did try to play with them with his sister but he kept getting a bit too excited and stealing her Mox from her. The brilliant thing about Mox is that you can do so many things with them. Your kids can take them in the bath or use them in water tables. They help develop communication and motor skills as they're firm so require a slight squeeze to make the mouth part move. Nothing that a toddler couldn't do though so very easy for most children. They work well with marbles which you can put in the eyes and in the mouth to turn into a rattle etc. There's even a left handed company which use them to help with left handed hand writing skills which I think is brilliant. Logan hates writing and although he's not left handed I'm sure these can help him with his writing in some shape or form. I could just slot a pencil in the Mox balls mouth and away he goes. Mox are made from food grade silicone, BPA-free, phthalate-free and latex-free and are suitable for babies to handle and mouth. I really do like them and at £4.99 per ball they don't break the bank in the slightest. You can even purchase a pack of three for £13.99 if you wish which would be handy as you can stack the balls on top of one another. Next up for investigating is the Oogi. Logan was sent an Oogi Family and one Oogi Glow. Oogi's remind me of little stick people but instead of hands, feet and a face they have suckers. It means that they can be positioned in all manner of ways. 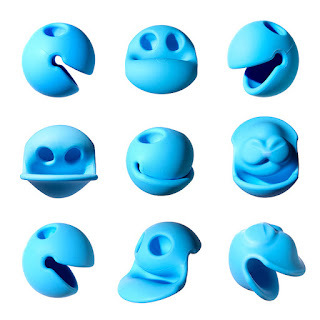 One Oogi can connect to another and the suckers mean Oogi can be used to connect any number of different objects together. They're made from super soft elasticated silicone and are latex and phthalate free so non toxic. Logan particularly enjoyed the feeling of them against his skin since they are so soft. 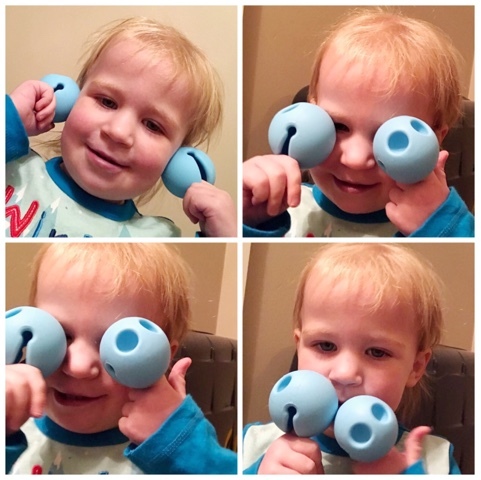 In the Oogi Family pack there is two big Oogi (one red one blue) and two small Oogi (one red one blue). It's meant to represent a family and it definitely represents ours well which Logan really liked. He clicked on straight away telling me which one was his little sister, Mummy, Daddy and even himself. He then moved on swiftly to playing zombie battles with the Oogi family and making them stick to different surfaces in his room. It was lovely to see his imagination come to life. Because they are quite soft and flexible Logan liked the way they moved and would bounce them around in his hands making them dance. The arms are long which makes the dancing quite mesmerising. The Oogi Glow is a single big Oogi figure that glows in the dark. This didn't stop Logan from playing with him during the day with the other figures but as night time would fall his excitement would mount at the thought of playing with the Oogi Glow in the dark. He loves lights and things that glow, as they all seem magical, so this was definitely a big hit for him. Even if it wasn't dark enough he would hide under his bed covers with the Oogi Glow and still see it working. 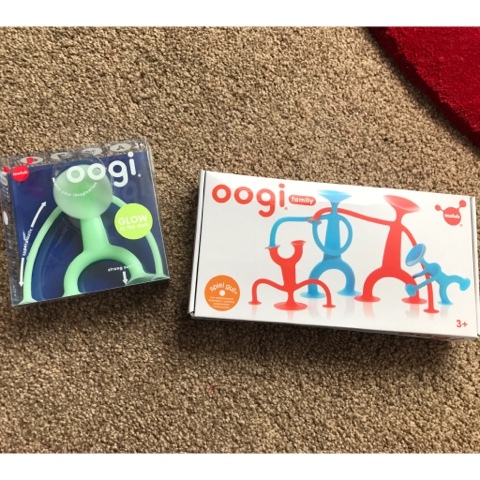 At £13.99 the Oogi Glow is fairly priced and the Oogi Family is a good bargain at £23.99 saving you £10 if you had to buy them separately. They're really great toys and so stretchy. I was worried that Logan would break his easily as he can be quite rough when it comes to his toys but we've had the Oogi for over a month now and they're still intact with no signs of any breakage. From an autism point of view both the Mox and Oogi make great interactive fidget toys as well as stirring the imagination and helping to develop communication skills. Sometimes for Logan to understand an every day event he needs to hear a story or see pictures before hand. The Oogi are great for this type of things as you can easily role play a scene with them. For example give each one a name of the person in your family and role play what would happen when you go to an airport and fly away for your holiday. It's this type of thing that will help ease anxiety and also familiarise children with what will happen. Even better is that you can then take the Oogi to the airport with you. You can also do this for the supermarket, cinema and other events which autistic people often find challenging. I don't think the Mox and Oogi are just for children either. I believe a lot of adults would benefit from them. I can happily see myself fidgeting with the Mox whilst I'm working at my computer desk. The soft texture and feel has a lovely calming effect and the fact that Logan had the Mox in his hands meant it stopped him from picking and hurting his own fingers. 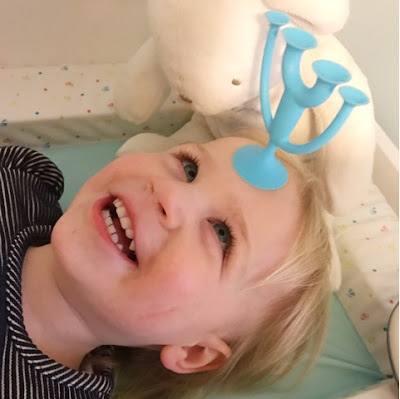 The Mox and Oogi are both brilliant additions to any child's (and adult's) life. I'll definitely be recommending them to friends, family and support groups we attend. If you fancy some yourself then do check out the Toyella website. They have so many different things to offer. 10 comments on "Working with Toyella: toys for children on the spectrum"
The Oogi's look awesome; there's so much potential there! The balls look really cool too, I like that they are so versatile. Thanks Ray, yes the Oogi's are fantastic and so are the Mox. They sound like an amazing company, really in touch with their customers. Great products too, very well thought out. They are lovely Lucy and they totally take the time to get to know your needs. They're pretty cool Kate. Thanks for having me. Definitely Sarah, I think the Oogi would be quite good in schools to promote social interaction.